Praxiology is the study of working and doing from the point of view of effectiveness. It has three components: analysis of concepts involving purposive actions; critique of modes of action from the viewpoint of efficiency; and normative advisory aspects in recommen-dations for increasing human efficacy. This sixth volume of the Praxiology series fo-cuses on action learning. Learning from distinguishable action is surprisingly different than learning from a sub-ject expert in human or book form. For those who have worked with and in action learn-ing, the latest form is always distinguishably different from a former experience. Action learning programs are not, in general, intended to tackle puzzles, namely, questions to which an answer may be said to exist even if that answer is difficult to find; action learn-ing is intended to help to develop the ability to tackle problems or opportunities, of which different persons, all experienced, intelligent, and motivated, might well advocate differ-ent courses of action, all reasonable. 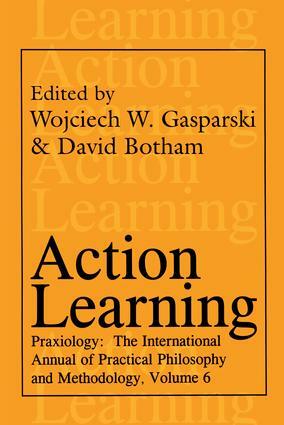 The essentials of action learning, according to this volume, are: there can be no learning unless the participant receives feedback about his/her performance; partici-pants learn only of their own volition and never at the will of others; the volition to learn is most readily engendered by the lure of success or by the fear of calamity. Building upon these essentials, the authors view action learning as a process of inquiry begin-ning with the experience of not knowing what to do next, and finding that an answer is not available from current expertise. All chapters in this volume are sound contributions to the continuing debate on the processes of learning from distinguishable action. Action Learning is intriguing reading for sociologists, philosophers, managers, and research-ers of all disciplines.